La Neuveville (pronounced neu-ve-ville) is the name of the medieval city on the shore of Lake Biel in the Bernese Jura of Switzerland. It is also the home of RSW. Last year RSW marked the 700th birthday of La Neuveville by creating a commemorative watch of the same name. At Baselworld 2013 the company will introduce a chronograph model to the collection, aptly named the La Neuveville Chronograph. The La Neuveville Chronograph is, by definition, a sportier version of its predecessor, which was a dressy three-handed watch with a vintage feel. For the chronograph, RSW enlarges the stainless steel case to 44 mm in order to comfortably house the legendary ETA Valjoux 7750 automatic movement. The case design, however, maintains the appearance of the original with its smooth bezel and patented crank crown, which unscrews and folds up to form a crank by which the wearer can wind the watch. On either side of the crank crown are the chronograph pushers. RSW puts a spin on the design of these, too, by shaping them like standard watch crowns – round with fluted edges – but turned sideways to fit inside the pusher apertures. The need to accommodate sub-dials means the dial of the La Neuveville Chronograph is significantly fuller than its predecessor, but it remains stylish, symmetrical and balanced nonetheless. The layout of the sub-dials is characteristic of the Valjoux 7750, with a 30-minute counter at 12 o’clock, 12-hour counter at 6 o’clock and small seconds at 9 o’clock. As a counterbalance, the day and date windows are at 3 o’clock. Every automatic version of the RSW La Neuveville Chronograph, including this model with a black dial, has applied silver-tone hour markers. The other dial colors are blue and gray/silver. Each dial is finished with a sunray pattern. Upon close inspection, the inner circles of the sub-dials feature independent sunray patterns wrapped in circular engraving. The hour and minute hands have luminous areas; the subsidiary round hour markers are also luminous. The primary portion of the dial is surrounded by a minute-and-second track that is enclosed by a tachymeter scale. Three bezel options are available for each model: the first is the smooth steel version pictured; the second and third have 12 and 84 diamonds respectively. Sapphire crystal is featured on the front and back of the watch. Every model can be mounted on either a black leather strap with steel folding clasp or a stainless steel bracelet with folding clasp. 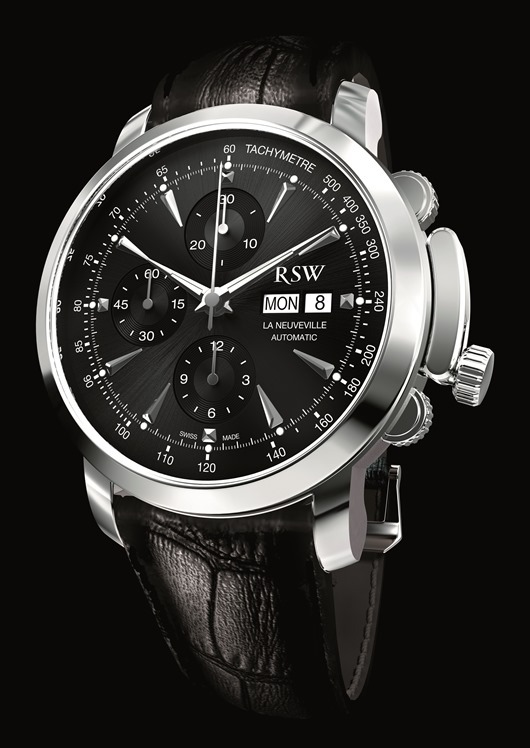 The RSW La Neuveville Chronograph also comes in a 42 mm model with a quartz movement. The crank crown is replaced with a standard crown and the layout of the sub-dials is slightly different, as is the addition of a big date at 12 o’clock. The 42 mm model has an additional case color option: yellow PVD with matching hands and hour markers as well as the option of a yellow PVD bracelet. Mechanical automatic or quartz movement, strap or bracelet, diamond studded or polished steel, the La Neuveville Chronograph by RSW offers another classic option from the brand known so well for its modern contemporary flair. Gevril Group, directed by company founder and long-time creative force in the watch business Samuel Friedmann, is the exclusive US representative for select European watch brands, distributing and servicing luxury, fashion and sporty timepieces at a wide range of price points. Additionally, Group Gevril operates a full-service watch repair department staffed by master Swiss watchmakers. Meet us April 25 – May 2, 2013 to view the RSW exhibit at Baselworld 2013, Hall 1.1, Booth D-19. 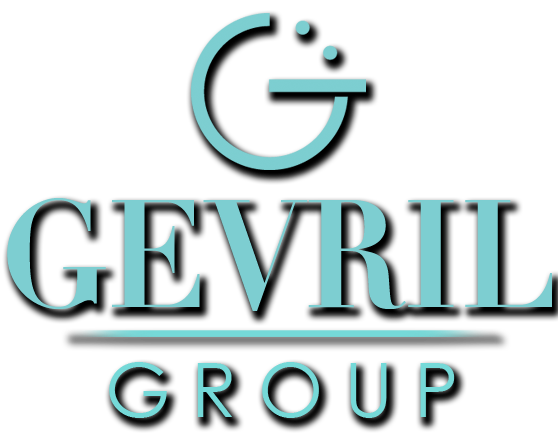 Contact Gevril Group, by email or at 845-425-9882.